Researchers report two new approaches to producing three-dimensional (3-D) images using X-rays that could improve disease-screening, study of very fast processes and enable analysis of the properties of materials and structural information of opaque objects with unprecedented detail. The researchers describe their approaches to 3-D imaging with X-rays in two papers in Optica, The Optical Society's journal for high-impact research. One method might reduce X-ray doses needed in some types of preventative medical imaging, such as breast-cancer screening. The other method might allow 3-D imaging of delicate biological samples or the study of very fast processes, such as the types of interactions that occur during space-debris impacts, to speed development of more durable materials. Because of their high energy and short wavelength, X-rays can pass through materials that visible light cannot. Although it is possible to obtain 3-D X-ray images, current approaches are limited in application because they require prolonged exposures to damaging X-rays. In humans, too much radiation from medical X-ray imaging can increase cancer risk, which limits how often they can be screened with 3-D mammography and other 3-D X-ray technologies. Very high-energy X-rays used to study the detailed make-up of materials and biological samples often cannot be used because the samples would be destroyed after one exposure. Researchers led by Andrew Kingston of the Australian National University together with a team at the European Synchrotron Radiation Facility (ESRF) in France have demonstrated for the first time that the unconventional imaging approach known as ghost imaging can be used to obtain 3-D X-ray images of the interior of objects opaque to visible light. "Because of the potential for significantly lower doses of X-rays with 3-D ghost imaging, this approach could revolutionize medical imaging by making X-ray screening for early signs of disease much cheaper, more readily available and able to be undertaken much more often," said the paper's senior author, David Paganin, from Monash University, Australia. "This would greatly improve early detection of diseases including cancers." Ghost imaging works by correlating two beams—in this case, X-ray beams—that do not individually carry any meaningful information about the object. 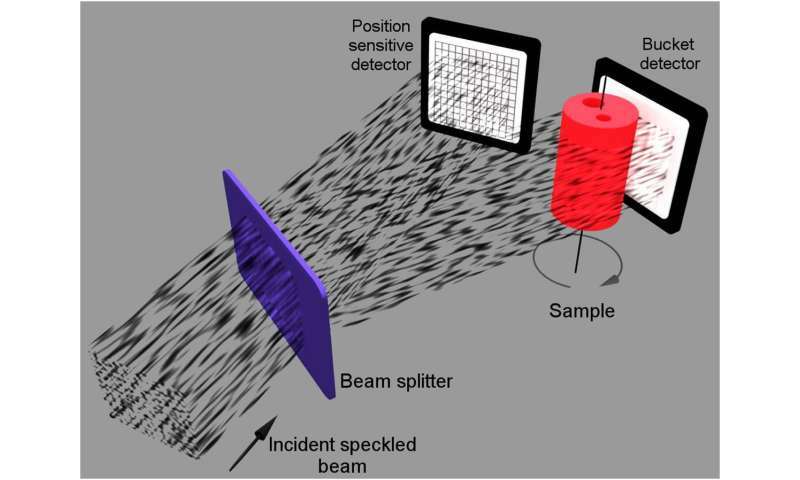 One beam encodes a random pattern that acts as a reference and never directly probes the sample. The other beam passes through the sample. The researchers created random X-ray patterns by shining a bright beam of X-ray light through a metal foam, which is like a sponge made of metal. They took a 2-D image of this random beam, and then passed a very weak copy of it through the sample. A large-area single-pixel detector captured X-rays that passed through the sample. The process was repeated for multiple illuminating patterns and sample-object orientations to construct a 3-D tomographic image of the object's internal structure. As a proof-of-concept experiment, the researchers carried out ghost X-ray tomography on an aluminum cylinder with a diameter of 5.6 millimeters and containing two holes of less than 2.0 millimeters diameter. They were able to produce 3-D images with 1.4 million "voxels"—a term for 3-D pixels—with a resolution, or voxel side-length, of 48 millionths of a meter. 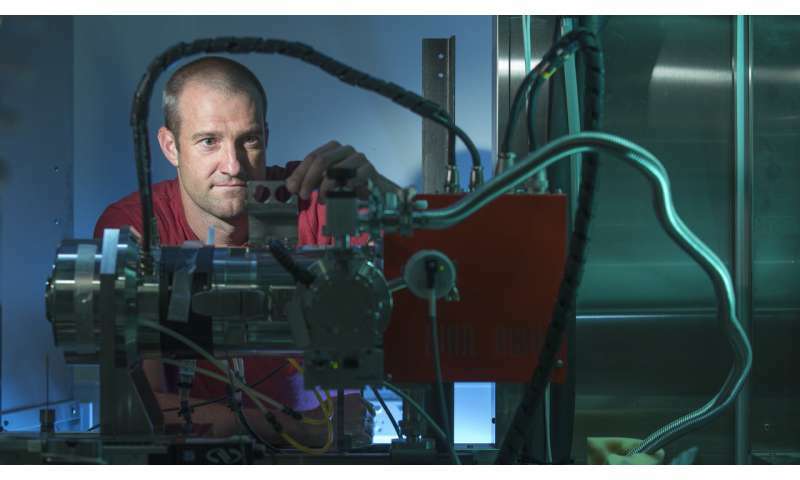 "X-ray ghost imaging, especially ghost tomography, is a completely new field that needs to be explored and developed much further," said Kingston. "With more development, we envision ghost X-ray tomography as a route to cheaper and, therefore, much more readily available 3-D X-ray imaging machines for medical imaging, industrial imaging, security screening and surveillance." A research team from the Paul Scherrer Institute in Switzerland, led by Marco Stampanoni, together with a team from the Deutsches Elektronen-Synchrotron (DESY) in Germany and the ESRF, acquired 3-D images using high-brilliance X-ray sources. Their new approach uses a single exposure, or shot, to obtain 3-D information from X-rays one hundred billion times brighter than a hospital X-ray source. The rays can only be produced at specialized synchrotron facilities. "High-brilliance X-ray sources are quite useful for biology and materials science because they can probe faster processes and higher resolutions than other X-ray sources," said the paper's first author Pablo Villanueva-Perez from DESY. "Because the power of these sources can destroy the sample after a single pulse, current 3-D imaging using the full power of these sources requires multiple identical copies of a sample." The new single-shot approach uses a crystal to split one incoming X-ray beam into nine beams that simultaneously illuminate the sample. Using detectors oriented to record information from each beam allows researchers to acquire at once nine different 2-D projections of a sample object before it is destroyed by the intense X-ray probe beams. The researchers used the approach to image a moth, which demonstrated the potential for studying insect mechanics with 3-D microscale resolution at speeds ranging from microseconds to femtoseconds. 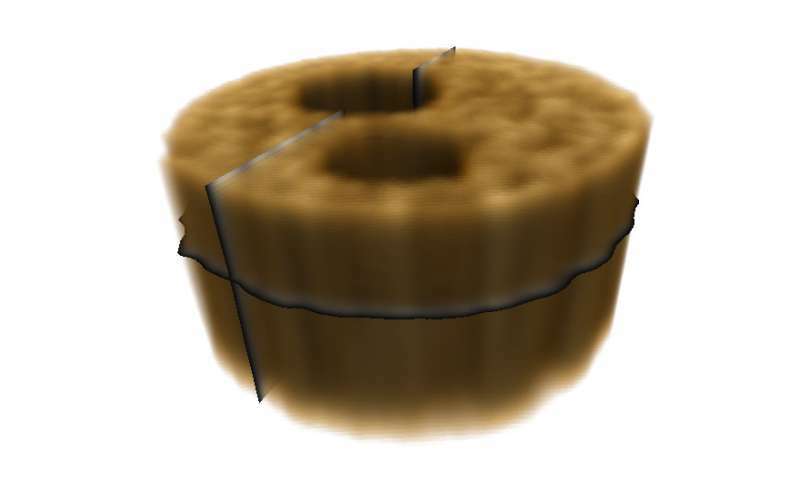 They also showed that they could achieve nanoscale resolution by imaging a gold nanostructure. "We would like to combine our technique with the unique capabilities of the European X-Ray Free-Electron Laser Facility, the first facility to deliver X-ray pulses at a rate of one million pulses per second," said Villanueva-Perez. "This could allow 3-D exploration of fast processes at speeds of millions of frames per second."